Club Nintendo in Europe is emailing specific people with the exclusive ability to buy an "Ambassador New 3ds" and they will ship out within about a week. This is very strange since to my knowing Nintendo of Europe has not officially given the New 3ds a release date and Nintendo in general have been very silent on details of the system release outside of Japan and Australia. Sadly you can't choose the XL size and these emails to buy it are only to a few random club Nintendo members. 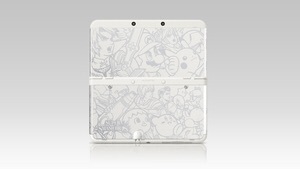 The "Ambassador New 3ds" will be white and have a unique custom faceplate. It comes with all the basics including a charging cradle but I don't believe it comes with an ac charger. I don't understand why Nintendo sells the system without chargers in other parts of the world. Personally I am not a fan of the color and I rather get a XL size but it would be very tempting to have a system early. Is this a signal we will learn more about the New 3ds release date to other regions soon? We shall see but I'll update you as soon as I get more news.